One of the major cities in the region known as the Research Triangle, the City has a population of 263,016 and is the 5th largest city in the state, while it is second only to Raleigh (458,880) in the region. 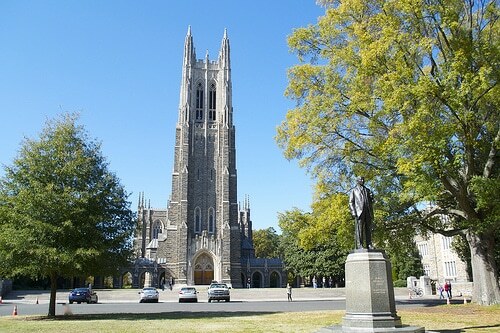 Because of Duke University’s prestigious medical center and the expansive pharmaceutical research in RTP, Durham is called “The City of Medicine”. In reality it’s old name “Bull City” is more generally used! Twenty-three miles from the Virginia border, the Bull City is in the northeast corner of North Carolina’s central piedmont, a geographic foothills region lying between mountains and coastal plains. The city is 140 miles from the Appalachian highlands and 130 miles from the coast. Find your Durham home, checkout Neighborhoods. There are numerous movie theaters in the city as well as bars and clubs close to downtown. DPAC has been regularly voted among the best theaters in the country while the Carolina Theatre in the downtown area is a traditional theater with a diverse program of events. The worlds most famous minor league baseball team, the Durham Bulls also call downtown home. There are several Parks and Recreation facilities in the area including city lakes, rope courses and several dog parks. The city also has several miles of Greenway Trails. The city has great transport links with I-40 I-85 and I-540 in the town giving access to local cities and the mountains and coast beyond. Research Triangle Park is a short commute from most of the area as is RDU International Airport. Finding a home in the Triangle area can be a daunting proposition! What are the benefits of Cary over Raleigh? How long is it going to take me to get from Holly Springs to RTP? What will I pay for a 3 bed, 2 1/2 bath home in Morrisville? Where do I find waterfront homes in the area? These are the type of questions we are asked on a regular basis. For honest, straight forward answers to these and other questions about Triangle Real Estate and the greater Triangle area in general please do not hesitate to contact Kevin, 919 349 0096, lingark@hpw.com.